The top 11 teams remained the same with a few slight shifts with BYU and Stanford splitting the first place votes. BYU moved to 16-0 on the year with a four-set win over San Diego on Friday and earned 60 of the 64 first place votes, keeping its hold on the No. 1 spot for the fifth-straight week. Stanford is No. 2 for the fifth straight week and stands at 14-1 after weekend wins over Utah (3-1) and Colorado (3-0). Minnesota moved up two spots to No. 3, sweeping Northwestern and upsetting Nebraska (3-1) to move to 12-2. Texas stayed put at No. 4 with surviving TCU in five sets and a posting a sweep of Iowa State. With the loss to Minnesota, Nebraska dropped to spots to No. 5 to round out the top group. Pittsburgh climbed to No. 6 and moved to 17-0 with wins over Syracuse (3-1) and Boston College 3-0. The No. 6 ranking is the team’s highest ever, following last week’s No. 8 listing. Oregon was the biggest mover of the week, climbing six spots from 20 to No. 14 after knocking off #17 UCLA and #12 USC in road sweeps. Michigan and Louisville each moved up three spots to No. 13 and No. 22 respectively. No team fell more than three spots, while Utah dropped out of the poll. Arizona State claimed the No. 25 spot at 13-5 after receiving votes last week. 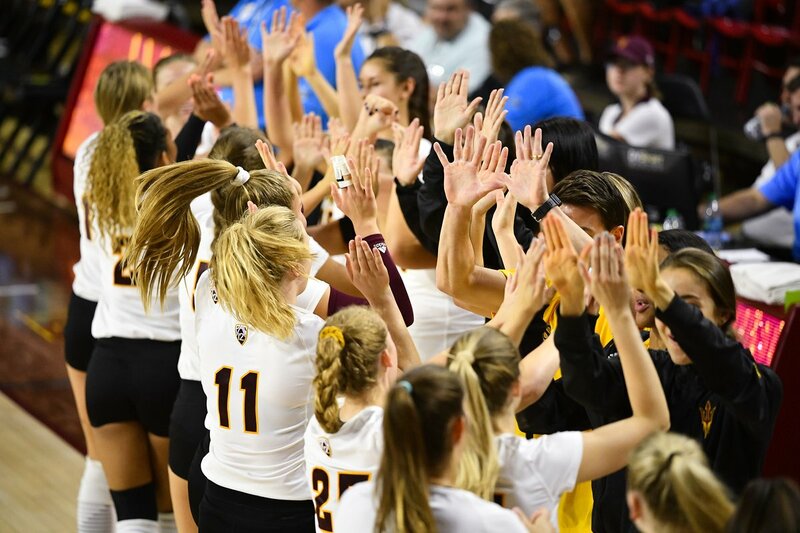 The Sun Devils lost 3-0 to Washington State, but rebounded with a sweep of #15 Washington. It is ASU’s first ranking since being tabbed as No. 24 in the Nov. 16, 2015 poll. Six teams mentioned on only one ballot for a total of 11 combined points.